What is Fenfast 375 ? Should You Buy Fenfast 375 – Yes or No? Synthetic, pharmaceutical fat burners are employed when weight loss is difficult and the current methods seem to go nowhere. That’s when you can take a supplement to make your body have a more positive reaction to everything else you may be trying in order to lose weight. Given its name alone, Fenfast 375 is reminding of phentermine – the very effective ingredient once used in diet pills but banned now, because of its side effects. It was indeed a dangerous product, but even like that, people had always wanted to find something that would work as good as it did. And so, various phentermine-related formulas were born. Since the very potent phentermine pills only stayed available with prescription in cases of obesity, manufacturers wanted to address the wider issue of excessive weight and make products that could be safely used by a greater part of the population. Fenfast 375 is one of these. Fenfast 375 is made by Intechra Health Inc. in the United States and refers to diet pills that can be obtained with no fuss over the counter. It is labeled a ‘rapid fat burner‘ based on thermogenesis and suitable for easier weight loss, without any painful or restrictive practices. Moreover, this is a product made to burn fat even during rest times. When combined with a diet, the tablets help stick to that diet and make it feel easier, reducing cravings and hunger. It will make calories burn at a higher rate for many hours under its thermogenic and metabolism boosting action. 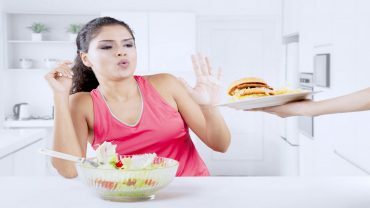 There is a well known connection between heat and fat loss. It’s what motivates people to sweat in the sauna, for example, when they aim to drop some pounds. Higher temperatures inside the body means that more fat is being melted away. This effect can be manipulated with the use of certain substances. Oftentimes, we are dealing with natural ones, like capsaicin in red peppers, but in this case it is entirely through lab-made, synthetic compounds. can burn up to 25 pounds per month. We are therefore dealing with claims common to countless slimming supplements, be they natural or synthetic. It is what appetite suppressants and fat burners tend to do, usually achieved through the stimulating effect. Considering its description, Fenfast 375 is expected to work on its own and achieve effortless weight loss. We will see below if that is realistic in its case or not. DL-Phenylalanine (an appetite-suppressing amino acid, also boosting energy levels; it could be the most important ingredient here, considering it’s of pharmaceutical grade and is common to all the top slimming pills; this is known to reduce the appetite). That is all that is listed and reviewers in general are suspecting there might be more ingredients but, unfortunately, not everything is disclosed. It looks like a too simple formulation for the effects and results it claims to have. There is some good news too, however. Each of the listed ingredients has been researched by competent organizations around the world, so there is a body of evidence for anyone who is either mistrusting or scared by this product. In any case, the thermogenic effect of caffeine is well documented and known to every coffee drinker there is; yet, the quantities cannot be too high, since the surplus of caffeine would lead to some terrible side effects. In general, there is no need to worry here, as all the ingredients in Fenfast 375 are clinically approved and already exist in various combinations on the diet pill market. The only side effects may be caused by caffeine. This is the usual culprit when it comes to side effects experienced with regular weight loss pills and causes typical sensations like dry mouth, rapid heartbeat, jittery feelings etc. It may cause thirst and, when that happens, you should definitely drink more water, since caffeine is a powerful diuretic. That is also going to help you with your weight loss goals, as confirmed by reviews. There is not as much information available as we’d like. For example, nowhere does it say how exactly the appetite is suppressed when using Fenfast 375. A metabolic booster alone is not enough to tone down the hunger, too. It is also unclear how it helps improve the mood, but the Beta Phenylethylamine HCL may hold a clue. Anyhow, the pill promises to keep the metabolic rate up for the whole duration of the day. Thus, one should enjoy maximized fat burning for all 24 hours. This may not so easily achieved though, knowing that the stimulating effect of caffeine does not (and should not) last that long. As for the rapidity of weight loss, it’s not always the same for everyone. Your dedication to the cause is eventually the catalyst. The effect of these tablets is more like a motivator, to make you able to accomplish more and sustain prolonged activity. The product mostly relies on stimulants, which isn’t necessarily a bad thing. After all, a more active body is one that burns fat more effectively, so that is exactly what some people need in order to drop pounds. Fenfast relies on the natural weight loss mechanism of the human body and thus does not require you to eliminate certain foods or change your lifestyle. Its minimal effect is expected to show regardless. You will be burning more fat cells as you go, minding your usual business. Some wisdom and caution are required, however, in order to be safe at all times and burn more fat. Only take it as prescribed and never later than lunch, because the amount of caffeine supplied by the pills by this time will already be enough to keep you alert through the day. Supplementing later might result in sleepless nights. Otherwise the pill is considered to be relatively safe. Note that it’s free of Ephedra and other such infamous, harmful compounds often found in fat burners. Fenfast 375 has been observed to elevate the mood. In addition, consumers felt more motivated to adopt healthier habits for the long run. Some have said that it mimics Adipex, a prescription drug for weight loss similar to Phentermine products. Fenfast could reduce their calorie intake by 50%, as reported, but this can also be the effect of caffeine alone, known to stave off hunger for hours in certain individuals. According to most reviews, overweight individuals did not see much of a change until they began exercising vigorously and with regularity. Sedentary people were the least satisfied ones and now we’re starting to see a pattern here. This is yet another diet pill that works better in conjunction with exercise and doesn’t do that much when it’s not being ‘helped’. Its action thus needs to be facilitated. Sometimes it’s hard to draw the line and tell where the effect of exercise itself stops and here that of the actual pill begins. Some claim that Fenfast 375 worked better when they supplemented their water intake. It seems like sensible advice to drink more water on a daily basis, considering there’s caffeine in every pill and it’s a diuretic. Plus, your body is flushing out more of what it’s stored when it’s getting such stimulants, therefore it is wise to help it. In some reviews, the product was praised for banishing the fat on the abdomen and improving the mood; in terms of weight loss, a common result appears to be the 3 pounds/week ratio. All in all, the product has doubled people’s motivation, thus leading to a major improvement to their routine. Their frustration related to weight loss had diminished. You have to take 2 pills in the morning before breakfast and 2 more before lunch to see results. This pill usually works fast, especially in terms of energy. Consumers get a boost quite quickly after their first dose. It effectively stops food cravings and makes one more focused, with superior mental clarity, which is probably due to the caffeine. All the potential effects were already mentioned in the paragraph above; however, not all of these are valid for everyone. Expect to lose an average of 3 pounds per week. The weight loss is continuous. You get 120 tablets per jar, which means a 30-day supply. Results show within a month, but the start may be less obvious (it could take time to adjust and to trigger the much expected weight loss), which is why buyers get more jars. Also, shipping costs are avoided with bigger orders. The supplier includes no returns, which is why many feel reluctant about it. Once you order it, it’s yours. Who can take Fenfast 375? The product is made for people of any age and size, male and female, but not for children and teenagers. 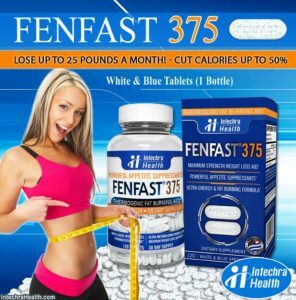 Fenfast 375 is made in the United States with high quality ingredients only, by Intechra Health, as part of its weight loss pill line. 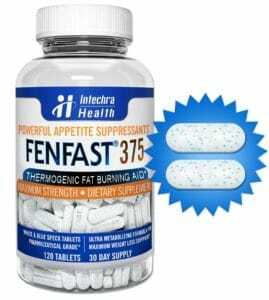 Fenfast 375 is a simple, straightforward weight loss solution in tablet form that addresses the core issues in losing excessive pounds: the metabolic rate, uncontrollable hunger, low energy and cravings. However, out of these, it seems to address the energy levels best. It is not a natural but a synthetic product aimed at burning fat more rapidly but is surely a safer alternative to Adipex or Phentermine drugs, which aren’t as friendly. Therefore, people who have been curious about these may now try this option and see if it works for them, instead of risking their health with the aforementioned products. 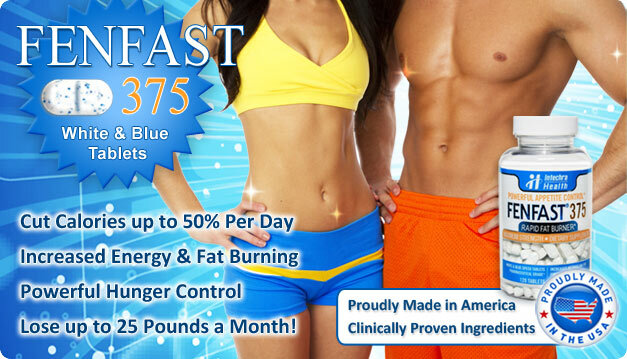 Fenfast 375 is best integrated to a complex weight loss program. Fenfast 375 is not the only diet pill that tries to act like phentermine. There are many other manufacturers and brands that sell similar products, often for cheaper prices and with a more varied list of ingredients, also including natural extracts that work. If you’re feeling determined to try out a synthetic pill and aiming for quick results, you may give it a try though. This shouldn’t be your only support in weight loss however, so don’t make such plans. In any case, do not purchase from third-party resellers. Get the high-quality tablets from their original manufacturer and seller. Note that this product can be quite expensive, considering that the price for a moth’s supply is of $58 plus the shipping fees, which are about $20. Only orders of $129 and above benefit of free shipping but you’re also getting a free bottle, so the company is obviously encouraging bigger orders.